Many people have unrealistic expectations on launching new apps. They think that free is the only way to go for a number of reasons and they're wrong. On this blog and newsletter, I'll share my download numbers, analytics, revenues, and ideas related to app promotion and marketing on top of iPhone programming basics. Lets start with some app marketing. I keep hearing the same thing again and again from people making apps. "we want to start free"
"the apps not ready to be a paid app"
"I don't feel comfortable charging for so few features"
If you don't charge money, you're not going to make any money and you are going to have a very hard time getting downloads. You're not Angry Birds, so you're going to have to do things differently. Numbers speak more than "i think this" or "I think that." I've launched both paid and free apps, and my paid app has 10x more downloads. Why? Photo Table is my most successful app, because it's a paid app, not because it's a free app. It regularly pulls in $400-600/month from paid sales at $10. Yes, you can sell apps at $10. Higher price points can make more money than $1 apps for low volume apps. We'll talk about price in a later blog post. Don't pay for promotions, especially when you can get them for free. I've done three price drops with Photo Table and they've all generated tens of thousands of downloads per day. On December 14th 2011, I dropped the price of Photo Table from $5 to $0. Being a higher paid app, this price drop caused a lot of services (i.e. Apple Sliced, AppsFire, AppShopper, etc) to pick up the "money saving" deal and promote it (No cost). AppAdvice.com reviewed Photo Table earlier in the month (No cost). When it went free, I emailed Tyler at AppAdvice to get them to feature it in Apps Gone Free (No cost). I asked Free App Magic to feature Photo Table (No cost). Photo Table went free on December 14th, 2011 and was downloaded 183,000+ times. At the time I wasn't sure if this was an easy thing to do, or something hard. Turns out, it's hard. Lots of companies pay money to get tons of downloads, and I found a way to do it for free. During the free promotion period Photo Table soared to #2 on the Top Free Photo Apps and #55 on US iPad Apps. That was awesome! In a future post, I'll explore app rank and chart position. Photo Table was downloaded 183,000 times in 4 days. 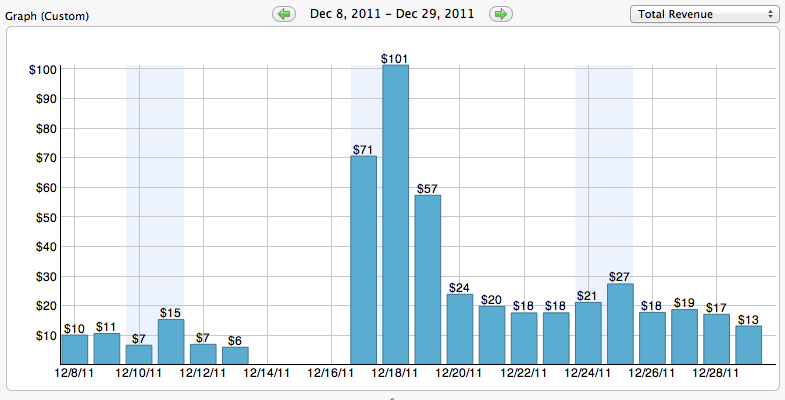 I was given the impression from promotion services that I'd make a ton of money when I switched back to paid. I didn't. It was good, but not great. In going paid again, I decided not to start at $1. It was a test to see if customers would rather pay $1 instead of $5 for the app. The first three days were great, a large improvement over the previous week. However without much viral sharing, the app quickly disappeared from the top app charts. Less visibility means less downloads and less revenue. To combat this decay, you need to build in social components deeply into the workflow of the app. We used Facebook photo posting with a link back to our website as the default text. It helped, but it wasn't the best. Pre-populated text for Facebook posts are free advertising. The App Store review system is a one way street. You can't talk back to customers. Based on my experience with Artwork Evolution, I built a email popup into Photo Table. Email is a great way to connect with customers and to provide direct support for your apps. The feedback was one of the most encouraging results of the price drop. I had tons of emails from people who liked the app, hated the app, or had suggestions for the app. It was awesome, inspiring, and mostly uplifting to talk to actual customers. Real people were emailing me. Real people with problems that my app solved. People with cancer, jewelers, artists, photographers, and every day parents. Apps are fun to make when you can interact with the users and see how they use your apps. You get ideas, excitement, and motivation from your customers. Check back soon to see the affect of doing price drops too frequently. Signup for the Newsletter to stay in the loop. p.s. curious about Apps Gone Free? To submit an app, simply send a request to tyler@appadvice.com with the subject 'Apps Gone Free.' Please include the name of the app, a link to it in the App Store, when and for how long you intend to offer the app for free, and anything else you would like to share. We will take it from there."